A web app that will gather and display content about recorded/streamed music. We need a web app that will gather and display content about recorded/streamed music. The domain model includes Artists, Albums, and Songs. Your app will display each collection on a ‘list’ view. In addition, your app will enable the user to ‘create’ new items in each collection (on a ‘create’ view). Your professor recommends that you use scaffolded views, to reduce the amount of work. Most of the views will require a small amount of changes to meet the use case. 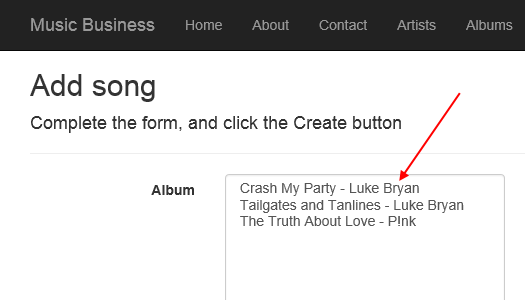 For example, the ‘add an album’ must display an HTML <input> or <select> element to enable the user to choose the album’s artist. In addition, the ‘list’ and ‘details’ views will need to render data from associated objects. Create a new project, named “Lab5”. No authentication. This technique enables us to declare but not store a date. For a Song object, it may not have a value for ReleaseDateAsSingle, because the song may never be released as a single. However, this property will need special handling later, because you must compare it to null before attempting to use its value. In addition to the three classes above, create a Genre class, with Id and Name properties. We will use the data in its collection as a lookup table. All three entities will have a string property named Genre. However, for this app, we do not want to create an association from (for example) the Artist class and the Genre class. We’ll use the Genre data collection as a somewhat static resource. Remember to add a default constructor to initialize collections and non-null dates. Recently, you learned about data annotations. Add suitable data annotations to these design model classes. Use your discretion – it is not necessary to add data annotations to every property. A ‘to-one’ navigation property must have the [Required] attribute. Follow the other guidance in the notes and reference material. As you recently learned, create a throw-away controller, which will 1) add the Entity Framework classes to your project, 2) write a connection string, and 3) create a ‘data context’ class. After the scaffolder finishes its task, you can delete the throw-away controller (and its views, if it created them). Then, make sure you add the remaining entity collection properties to the data context class source code. Or, manually code these components yourself. At the bottom of a “Models” folder source code file (either DesignModelClasses.cs or DataContext.cs), add a store initializer class, as you recently learned. Add several Genre objects. Use your knowledge, or iTunes, or another resource to create at least eight (8) genre objects. Genre names could include Pop, Country, Classical, Hip-Hop, and so on. Remember to configure the MvcApplication class’ Application_Start() method to start/run the store initializer. Add AutoMapper to the project. Add a Manager class to the project. Add the necessary ‘using…’ statements (for the Models namespace, and the AutoMapper namespace). Remember to add a class-level private field (variable) that references a new instance of the data context class. 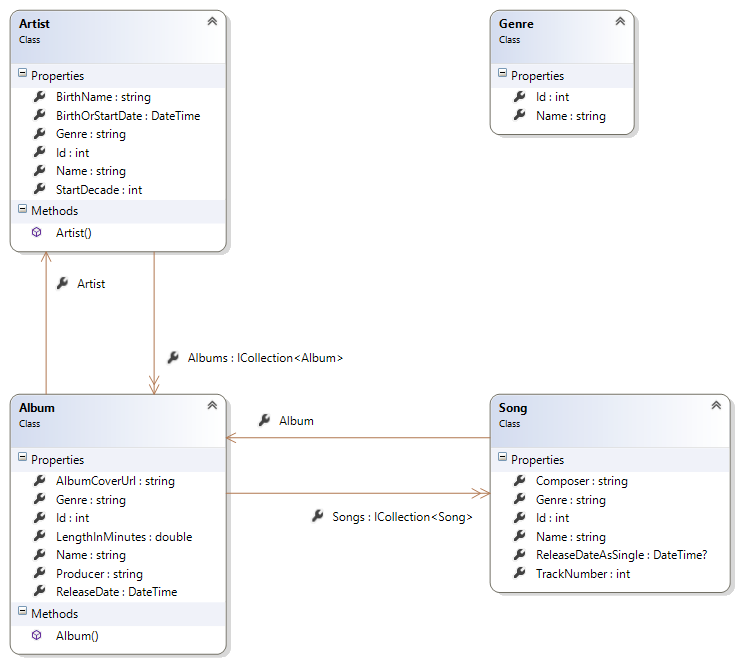 For each entity (Artist, Album, Song), write the view model classes for list, add, and base functions. For each ‘add‘ class, simply copy most of the properties from the entity’s design model class. The Id property is not needed – do not copy it over. Navigation properties for collections are not needed – do not copy them over. Later, you will also write ‘add form’ view model classes. Add controllers for Artists, Albums, and Songs. Use the “MVC 5 Controller with read/write actions” template. In each controller, you can remove the ‘edit’ and ‘delete’ method pairs, because we will not need them for this app. Also, ensure that you add a private field (variable) that references and initializes a manager object. Write an ‘add form’ view model class for the ‘add new’ artist task. Why? The HTML Form needs a <select> or <input> element to enable the user to choose a genre. We need to send the data as a SelectList object. The best way is to copy-paste the existing ‘ArtistAdd’ view model class, to a new view model class named ‘ArtistAddForm’. Then, change the type of the Genre property to SelectList. See this document for rendering and styling suggestions. In your view code, pre-select one of the genres. Set the focus to the artist name textbox. We want this data as a simple string collection. Then, we can bind it to the collection argument of the SelectList constructor in the controller Create() (HTTP GET) method. The genre objects have an Id and a Name property. You need only the Name strings. Write a method that accepts an ‘artist add’ object, adds it to the persistent store, then returns an ‘artist base’ object (or null if not successful). As you know, the Create() method – which responds to an HTTP GET request – is used to prepare the view to display an HTML Form. 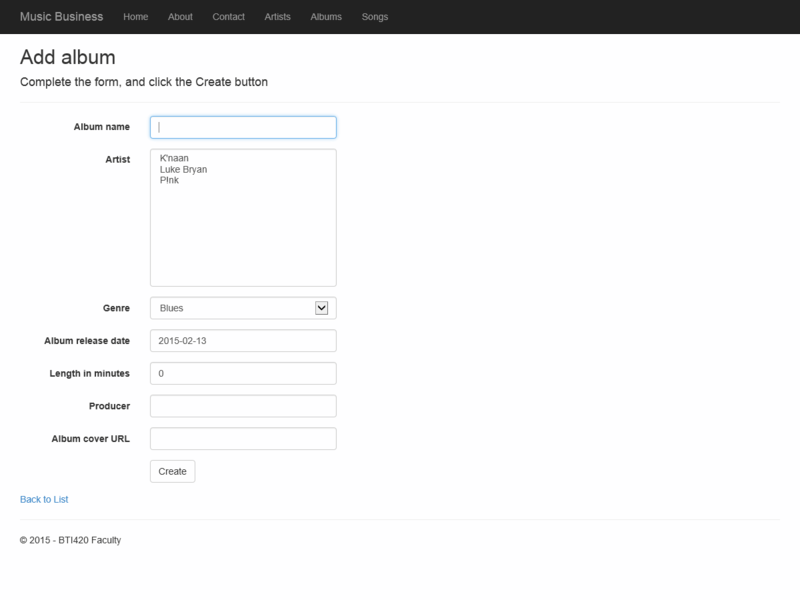 We create an ‘add form’ object, and configure it with reasonable initial values. Write a standard Create(ArtistAdd newItem) method to handle the browser’s HTTP POST request. The controller template has a method implementation; replace it with the now-standard ‘if model-state-is-valid’ approach. The RedirectToAction() target can simply be the Index view for now. You could change it later if you wish. Edit the titles etc. of the view, to customize it to this app’s needs. Write a manager method to fetch and return all artists. It would be a good idea to sort the results by artist name. Edit the code to ensure that the method’s return statement passes the ‘artist base’ collection to the view. Write a method that returns a collection of ‘artist list’ objects. The collection must be sorted by name. When adding a new album, the artist must be configured. 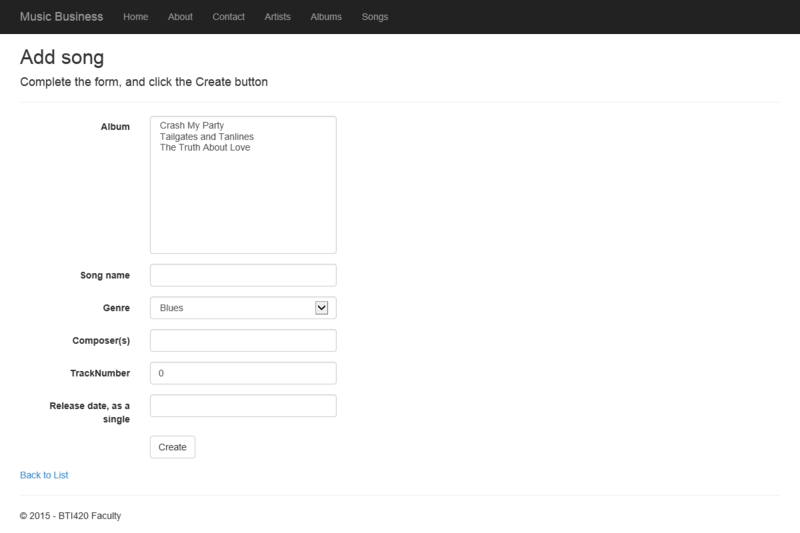 Therefore the ‘album add form’ will need a SelectList of artists (using the ‘artist list’ view model class). It also needs a SelectList of genres. 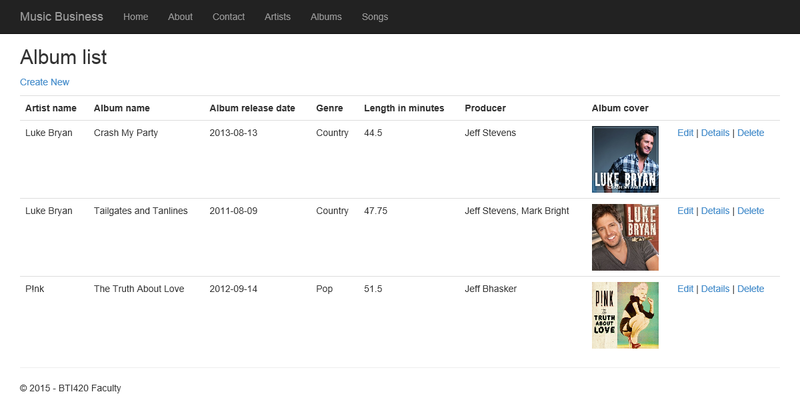 The manager method that adds a new album must validate the artist identifier before attempting to add the album. This will be similar to the set of tasks you did above for the artist entity. That’s pretty ugly. ArtistId? Zero? Your manager method probably did not use the Include() method. And what about those URLs? Ugly. Would you like yours to look like this? Use the Include() method to get the associated artist object. Add another property to the ‘album base’ class. If you want the artist’s name, add an “ArtistName” property (which is a string type). You could also add a [Display…] data annotation to make a nice title. Change the column titles in the table header row, to match the new columns. In the data row, replace ArtistId with ArtistName. Then, replace the AlbumCoverUrl content with an <img> tag, using the AlbumCoverUrl string data. Write a method that returns a collection of ‘album list’ objects. The collection must be sorted by name. When adding a new song, the album must be configured. 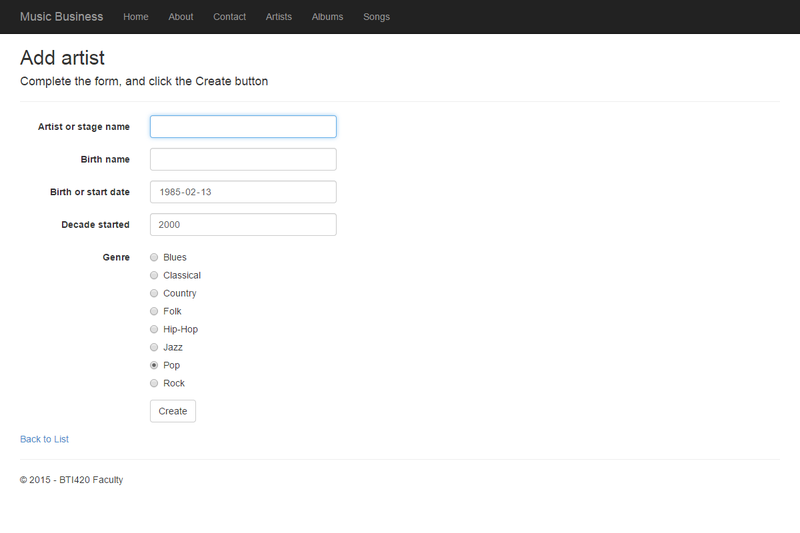 Therefore the ‘song add form’ will need a SelectList of albums (using the ‘album list’ view model class). Would you like a better “Album” listbox? Add more properties to the ‘album list’ class. Here, we created a composite of the album name, and the artist name. When creating the AlbumId SelectList, the dataTextField will be the new composite property name (“AlbumAndArtist” above). The manager method that adds a new song must validate the album identifier before attempting to add the song. This will be similar to the set of tasks you did above for the album entity. Optional – would you like your list to look a bit better? With names for the artist and album? Change the AlbumId column title to AlbumArtistName. Add another column for AlbumName. In the data row, replace AlbumId with AlbumArtistName. Add another column for AlbumName.